Enough of this rattle and yammer. Lucky for us, the developer is not shy with words. So, we’re going to let him tell you what “CoolTweak” does. And keep in mind my friends, it does all of this with just a right-click on picture. Good stuff! Take it away Mr CoolTweak! 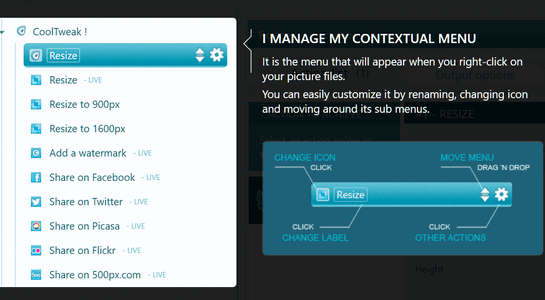 Resizing and cropping your images gets really simple with CoolTweak. Downsize huge pictures from your camera in seconds to share them easily. CoolTweak makes easy to add a custom text or logo to all your photos before sharing them. Many cool options are available: set opacity, rotation, pattern repeat and much more. 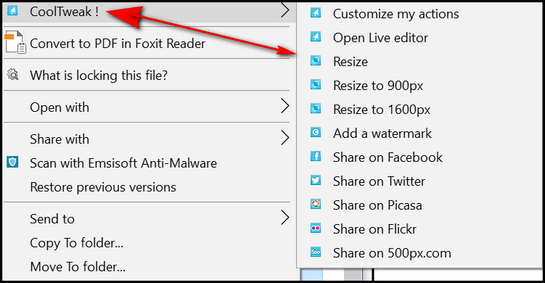 Sending your files to Facebook, Twitter, Flickr, Google+ and 500px is no problem. A publishing windows guides you along the process so you can choose where and how the files are posted. CoolTweak is just a click away, trigger your processing by right clicking any file or folder, that’s it. The app can handle recursive browsing to process files in sub folders. That’s a lot of stuff but it even does more that what’s in included above. Also, CoolTweak, is very customizable — you can modify or remove any of the program’s presets, or even add your ownto them. If you often find yourself resizing huge photos from your digital camera so you can email them… or if you upload a lot of photos to share on social media like Facebook or twitter… or if you often need to resize a single image or a whole folder full of images on the fly… you should give CoolTweak a try. It will save you a whole lot of time. 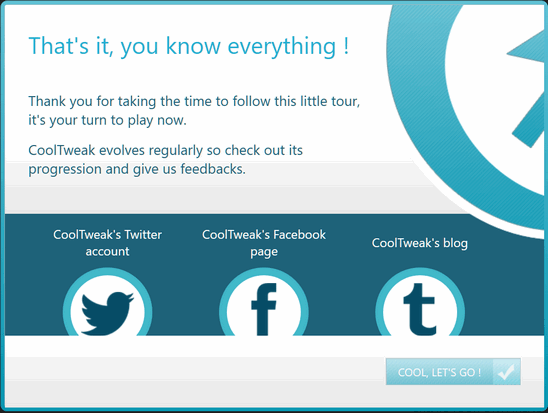 After you install CoolTweak, you’ll be given a very classy walk-through of some of the program’s features. Above: CoolTweak shows you how to customize its preset right-click menu. Above: More cool stuff you can so with CoolTweak shown in the tutorial right after you install CoolTweak. Above: The tutorial reminds you to save your customizations lest ye lose them. Above: See? If you take this “tour” (tutorial) you’ll know everything! Ya think? Above: We’re playing with some of CoolTweaks’ options. Notice options that come with CoolTweak – we hadn’t customized any settings yet. Note you can right-click on any picture, resize it, watermark it, share it on Facebook, Twitter and online photo sharing sites. So, if you think you would like the convenience of being able to right-click on any picture and resize it, watermark it, and/or share it, then CoolTweak might be just the tool you’ve been looking for. It’s free. There are no download tricks or bundled software/malware. Just good freeware. Visit the CoolTweak website to learn more about it – and/or download it. At the website for CoolTweak, it says you have to be running Microsoft.net framework 4 on your computer to use the program. How do I find out what version I’m running on my computer? If you’re running Windows 7, 8, 8.1 or Windows 10 you have 4.0 .Net framework. 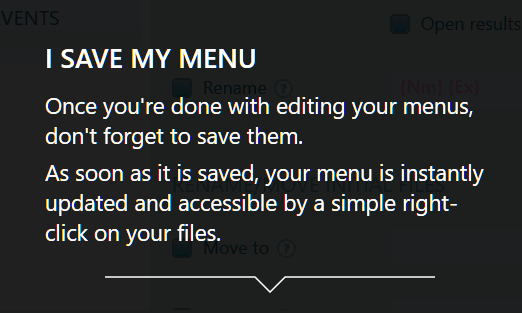 Dale, it’s a right-click context menu enhancement, not a program you click and run. Please take a look at the screenshots in the article… particularly the last one. You right-click on and image file and select CoolTweak from the right-click context menu. Looks like a fun and useful tool but I personally don’t like the ‘PRIVACY” section of the EULA. I think everyone should, especially the privacy section to see if you agree with what your giving up in exchange for a program or app. Nothing in life is really “free” anymore. Ever read the privacy statement for Windows? You’re using Windows, right? Yes I am am as most people do. There are not a lot of options out there for the average home user re: op systems but that doesn’t mean we have keep repeating it voluntarily. Opposing opinions should be welcomed. Just stating a viewpoint that others may also want to consider but may not be aware of. Voluntarily giving personally identifiable data deserves consideration.